Here's everything you need to know size package content and detailed specs reviews about Apple products my opinions on it. I know there are a lot of Apple gadget lovers out there, this is just my opinion by the way, for me Apple Products are very complicated to use in my view, I've tried to fix some peoples iPod mp3 players like the mini, Video, Nano, all of them same complicated, like for example copying music files to your player, the most simple method to do this, is just to drag and drop it from your computer to your mp3 players right, but you can't do that with an iPod, you will have to use their iTunes software before you can transfer music to your device and the iTune software isn't that easy to use unlike the MS office or some cellphone software, that you can use without reading its manual, to be able to use iTunes you'll have to read the help instructions, believe me and in my opinion the video players they made in those iPod is useless, why? because face the truth, are you honestly telling me that your going to watch a movie in your iPod? from downloading videos to your computer then, to your iPod?, that's just too much hustle just to watch a movie, I would rather buy a dvd and play it in my portable dvd player than to search and download for a show right? in time you won't be using this feature. 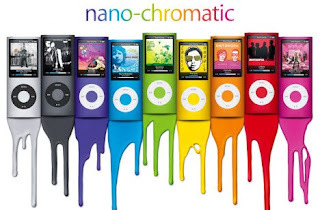 If they wanted to add features in their unit add something else like a radio frequency, although the gadget looks great, I have nothing against the looks of iPod Nano Chromatic. It's not just the mp3 players I don't like from Apple, also their Computers, you can't use all the software you normally use in your HP laptop computer or any other non Macintosh computers, you should find a Mac version to be able to use it, and the bad thing is not all software has a Mac version. its not apple's fault that not everything is compatiable. I have to agree that Apple do make a lot of stuff that really is just difficult to use - its like their trying to be different but its not really working ... in saying that though I've had an apple mini for around 4years and its still one of the best things I own (and it only plays music) Def have to agree on the whole itunes thing though would be much easier to just have a drop/drag situation. i do have to agree that the itunes can be alot better and the mac computers well there good if you know how to use it. i just got an ipod nano chromatic and it doesnt matter if you want movies, you can put the latest episode of the simpsons or a funny part on south park it doesnt really matter. I really like the new ipod. the scrolling circul feels really fake. You should get one though! Nice troll, may be not sarchastic enough. Nice troll, should be more sarchastic though. 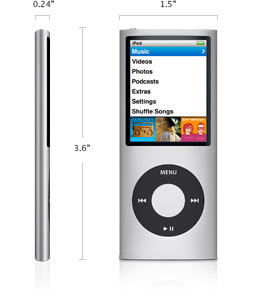 It is alot easier to use an iPod nano and all ipods and you said you can just drag and drop for an MP3 player well its not that easy cause alot of the time you have to convert the song to MP3 or WMA and those also are no where near as good quality sounding as AAC which iPods hold. I myself am a 12 year old computer geek and I know my stuff. And to put music on an iPod all you have to do is plug it in and it does the rest. Plus alot of MP3 players need a battery and this 1 has a built in rechargeable battery so thats easier as well. also iTunes is a very easy to use software it is alot more easier than media player 11 and Vista is so hard to use that now when you buy a new computer it comes with aa windows XP downgrade installed thats how crap that can be. Ohh and FYI iPods are not MP3 players Brain box. And apple mac OSX is great I have the TOP apple Mac and its easy to use. Mate I think you need to learn some more stuff before you go criticising these things. HUH! you just got beaten by a 12 year old HOW BLOODY EMBARRASSING! No affence or anything Im just a little annoyed when people dont quite know their stuff. This thing is crap, I shook it to shuffle and it slipped out my hand and fell in the road. Now the pixels on the screen are flickering all different colors because the only thing holding the screen in place is its cheap aluminum body. I LOVE the iPod Nano compared to my iPod Nano 2g. My iPod Nano 2g only played music and it was really boring after a while... Plus, the iPod Nano has Cover Flow which makes it a WHOLE LOT easier to look for music instead of scrolling.